← Class for Getting Organized this Summer! Even More Summer Reading Challenges and Books for Boys! We’ve been bonding with cousins this past week at Grandma’s house! It was fun to see my sister read some books to our nieces who were here from Maine. How are you all coming with your summer reading? I found another great source for encouraging summer reading. It’s this podcast, episode 27, from the Read Aloud Revival. The lady interviewed in the podcast mentioned yet another summer reading challenge. This is about the fourth summer reading challenge I’ve mentioned, so I am not sure what we will be doing when we get back from Utah and return to normal summer life. They all look so good! See here and here. Here’s another Christian summer reading challenge for kids here. One thing for sure, we will be doing lots of reading! 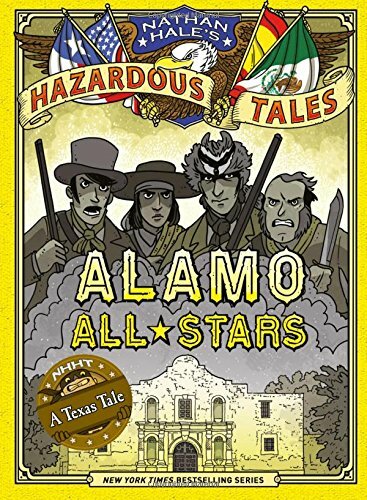 I plan on getting my reluctant reader (11 year old boy) involved with the new book on the Alamo from Nathan Hale. My sister picked up her copy for her kids to read on the train ride back to Maine. They are probably reading it right now! Hale’s books are graphic novels of actual historical events, and my 11 year old loves them! I will also be using this guide to boys and reading here. i love having something to look forward to after vacation! If you are thinking you don’t have time to read yourself, try reading a book instead of going to Facebook, or whatever indulgent digital activity you do each day. You will see the minutes add up! Here are some ideas from blogger Crystal Paine about how moms can find moments to read to herself. See here and here. If you want a summer reading guide for yourself, check this out from Modern Mrs. Darcy It has too much fiction for my taste, but maybe you will like it. I just picked up a bunch of nonfiction books for a dollar each at the thrift store, including Boyd K. Packer’s biography and the Tipping Point by Malcolm Gladwell, so I think I will plow through those. I I can’t wait! Let’s stretch our brains with reading this summer!